LAS VEGAS – Artificial intelligence (AI) and machine learning (ML) are already being used by media and entertainment companies to enhance the content they are creating, as well as the way that consumers are consuming that content, according to executives at Comcast and Dolby. 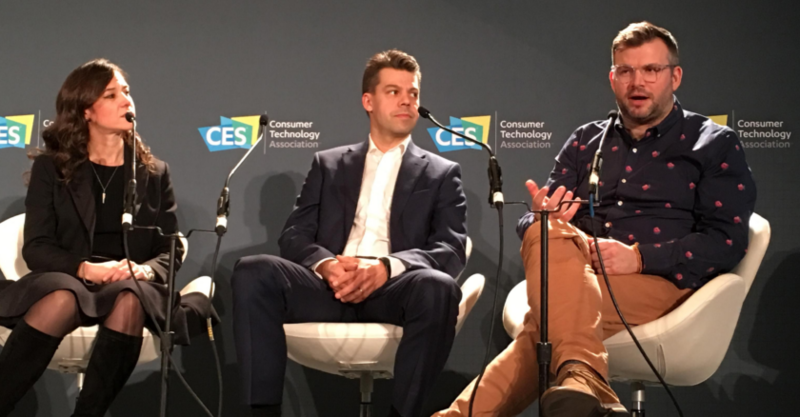 At Comcast, “we use a lot of machine learning,” including for content discovery on the company’s X1 next-generation TV platform and voice control, Fraser Stirling, SVP of digital home, devices & AI at the company, said Jan. 7, during the AI conference track session “The Future of Entertainment with AI” at the Consumer Electronics Show (CES). Dolby Laboratories, meanwhile, “develops technologies for creators and consumers that enable and enhance entertainment experiences,” Dr. Poppy Crum, its chief scientist told attendees. If you look at “creation, production and consumption,” Dolby in many cases collaborates with creative artists and entertainment companies, including Amazon and Netflix, she noted. And “machine learning and AI are becoming ubiquitous at every one of those stages,” she pointed out. AI is significantly changing several areas of the entertainment creation process, she noted. For one thing, “the professional workflow is completely being disrupted in terms of its operational efficiency,” she said. For example, the need for multiple cameras is being reduced, while “intelligent algorithms” are creating “opportunities to bring highly enhanced experiences to consumers,” she told attendees. On that front, she pointed to the Wimbledon tennis highlight reels that have been created by IBM AI based on face tracking and the players’ emotions. We’re also seeing a “democratization” of viewing experiences that’s resulting in better content and a “huge disruption in who the creators are,” she said. AI can also be used to enhance storytelling, she went on to say. The use of AI for Wimbledon highlights was also similarly done by IBM for the U.S. Open starting in 2017, when it announced the launch of IBM Watson Media and its suite of AI-powered solutions on the IBM Cloud that analyze images, video, language, sentiment and tone. By combining IBM Watson with IBM’s video capabilities, the United States Tennis Association (USTA) was able to start rapidly sharing highlight videos of more matches while engaging and informing fans more than ever before, IBM said at the time. AI and ML are also “able to add meaning to the content” and “enhance the quality of the content” that is being offered to consumers, Paul Melin, VP of digital media at Nokia Technologies, said during the same CES conference session.